Boulder, Colorado. August 7, 2014 – After a 10-year journey that began in March 2004, the European Space Agency’s (ESA’s) Rosetta on Wednesday became the first spacecraft to orbit a comet. The orbiter’s payload includes the Alice ultraviolet spectrograph developed by the Southwest Research Institute (SwRI) in Boulder. Rosetta’s rendezvous with Comet 67P/Churyumov-Gerasimenko has opened a new chapter in Solar System exploration. Comets are considered to be the building blocks of the Solar System and may have helped to seed the Earth with water, making life possible. Rosetta will help answer fundamental questions about the origin and evolution of our solar system and the role that comets may have played. “The Rosetta investigation is designed to provide an unprecedented window into both the origin of comets and the way comets work,” said Dr. Alan Stern, Alice principal investigator and an associate vice president of the SwRI Space Science and Engineering Division. Alice will analyze gases in the comet’s coma, which is the bright envelope of gas around the nucleus of the comet, and developed as a comet approaches the sun. Alice will also measure the rate at which the comet produces water, carbon monoxide and carbon dioxide. These measurements will provide valuable information about the surface composition of the nucleus. Since its launch, Rosetta has made three gravity-assist flybys of Earth and one of Mars to help the spacecraft reach the comet. This complex course also allowed Rosetta to pass by asteroids Steins and Lutetia, obtaining unprecedented views and scientific data on these two objects. The rendezvous between the orbiter and Comet 67P/C-G occurred about halfway between Mars and Jupiter. The comet is in an elliptical 6.5-year orbit that takes it from beyond Jupiter at its farthest point from the sun, to between the orbits of Mars and Earth at its closest point. Rosetta carries a lander, Philae, that will descend to the comet’s surface in November 2014, attempting the first-ever direct observations of a comet surface. The ESA science team will use data from Alice and ten other instruments to study the comet and scrutinize the surface for a target landing site. Philae will drill into the surface, extract and analyze samples, and send pictures and data back to Earth. A primary site will be identified in mid-September. Meanwhile, the main Rosetta spacecraft will continue to orbit Comet 67P/C-G for over a year as it makes its closest approach to the sun next August, and then swings back out toward Jupiter again. Rosetta will continue to orbit Comet 67P/C-G until December 2015. “Alice will spend hundreds of days in orbit around Churyumov-Gerasimenko, analyzing the composition of its atmosphere, mapping its surface, and studying the properties of fine dust particles coming off the comet. It will be the first ultraviolet spectrograph ever to examine a comet,” said Stern. 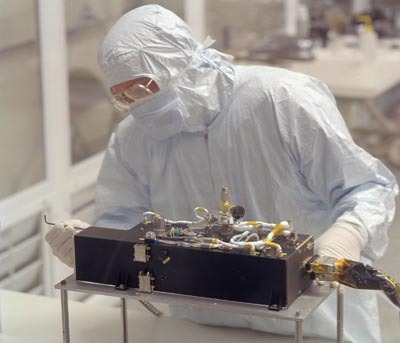 Alice is one of three instruments funded by NASA flying aboard Rosetta. Alice was built and is operated by SwRI under contract to the Jet Propulsion Laboratory/California Institute of Technology and NASA, with hardware contributions by the Centre National d’Etudes Spatiales of France. SwRI’s San Antonio headquarters built, and will operate, Rosetta’s Ion and Electron Sensor (IES), another instrument with miniaturized electronic systems. With a mass of 1.04 kilograms, IES achieves sensitivity comparable to instruments weighing five times more. Rosetta is an ESA mission with contributions from its member states and NASA. 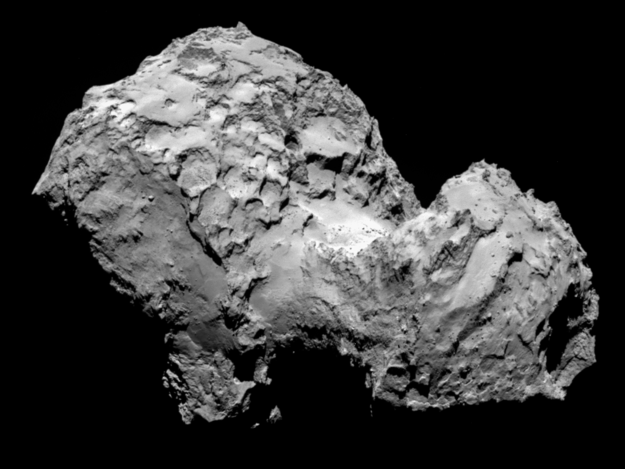 Rosetta’s Philae lander is provided by a consortium led by DLR, MPS, CNES and ASI. Airbus Defense and Space built the Rosetta spacecraft. NASA’s Jet Propulsion Laboratory (JPL) manages the U.S. contribution of the Rosetta mission for NASA’s science mission directorate in Washington, under a contract with California Institute of Technology (Caltech). JPL also built the Microwave Instrument for the Rosetta Orbiter and hosts its principal investigator, Dr. Samuel Gulkis. Southwest Research Institute (San Antonio, TX and Boulder, CO) developed the Rosetta orbiter’s Ion and Electron Sensor and Alice Instrument and hosts their principal investigators, Dr. James Burch (IES) and Dr. Alan Stern (Alice).